One of the most inspirational views in American golf is off the deck of Ben’s Porch at Sand Hills Golf Club after you’ve taken the mile or so cart ride up from the clubhouse. The entire Sand Hills panoramic opens before you, a diorama of green ribboning across a whipped and weathered horizon with players marching up and down the crumpled dunes like ants in a great three-dimensional farm. There’s not much I can add to the volumes and odes already written to Sand Hills; it creates devotees — instantly — like few courses on earth. 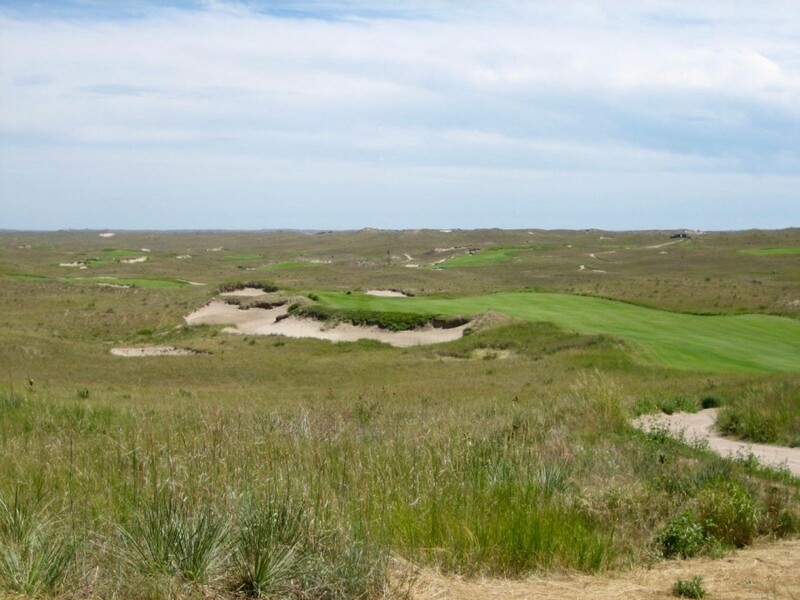 The Sand Hills atmosphere is charged and intoxicating, and the percolating sand soils and the wind and firm fescue and bent grasses make it maybe the most authentic links experience in the country even though the nearest sea is 1,500 miles away. The ground movement at Sand Hills is everything. Here, the par-3 3rd swings wildly left to right. And it continues once you get to the green. The simple beauty of its minimal manufacturing made it trendsetting in the field of modern design and construction, yet the process harkened back to a way golf courses were built generations ago. In the pantheon of sacred golf courses it deservedly occupies its own cordoned-off wing. It’s hard to imagine Sand Hills happening anywhere other than where it exists, the enormous scope of the holes magnified by this peculiar patch of endless American plain. The apse formed by this ominous bunker in the 8th green carries a strategic weight far beyond its small size. 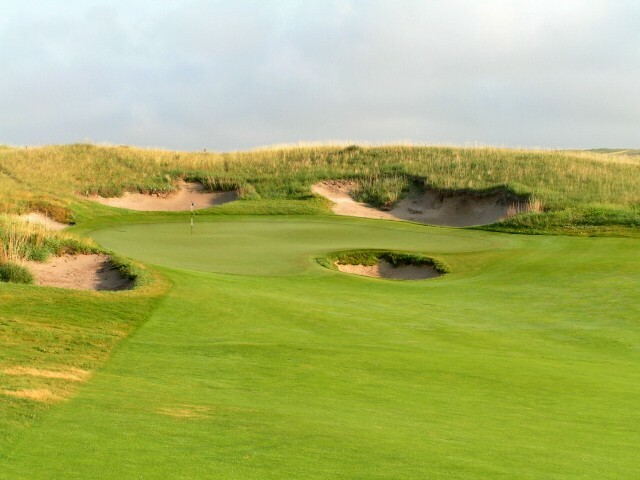 In contrast to the severity of its location and the intimidating natural bunkering, the course plays with a surprising level of elegance and maturity. It has aged spectacularly and its surfaces and slopes are, dare I say it, refined. They flow and tie in seamlessly to the surrounds because they are their surrounds, and the effect is simultaneously controlled and symphonic…if perhaps of the Sturm und Drang variety. Views like this of one of the world’s greatest and most original golf sites–here from the par-5 16th tee–are common throughout the round at Sand Hills. Which is not to say the course isn’t perilous. This is still the land of Buffalo Bill, still a searching frontier, and the high (or low) temperatures, summer humidity and heavy winds can require a fortitude and stamina more common to ranching than playing golf. In these conditions the exceedingly wide fairways shrink and the bunkers loom larger. In places, like the two par-5’s on the second nine, you can find your ball hopelessly out of position and out of sight in hollows on the edge of the fairway. The approaches into uphill or otherwise un-viewable putting surfaces — 1, 2, 11, 12 if in the depression on the left, 13, 15 and 18, if you must know — can be psychologically defeating. Kicking ground contour like this at the downhill 10th make it possible — and often necessary — to bounce the ball onto the green from the fairway. Just a little course out on the big Frontier.